HOW CAN I MAKE MATHS FUN? 1. SMILE & BE PASSIONATE! Do this when you talk about maths, and everyone else will enjoy themselves more too – yes that’s right, smiling really is infectious! Brian Cox, Johnny Ball, Rachel Riley and Drs Chris & Xander van Tulleken are all experts at talking passionately about their subject. Be sure to catch the R.I. Christmas Lectures on TV each year if you want to see some great science and maths communicators in action! DICE: great for counting, adding, multiplying and probability (Primary), probability (GCSE) and Normal Distributions (A-level). Try rolling one, two or three at a time, add the scores and keep a tally chart of what happens. 3D SHAPES: when discussing properties of 3D shapes, it certainly pays to have actual hemispheres, pyramids & cubes that you can pick up and touch close to hand. PEOPLE: that’s right, use of volunteers in a maths demonstration can reassure your audience that you’re not cheating, provide an extra pair of hands, and be really funny: especially if they have to wear something funny or do something “dangerous”. Some of my other favourite props to use in maths demos include balloons, juggling balls, pulleys, funny hats and even buckets of water. 4. TURN PROBLEMS INTO PUZZLES: a mathematician isn’t someone who finds maths easy, it’s someone who enjoys that it’s hard. But luckily for maths, humans have evolved to enjoy solving puzzles, so one way to make maths fun is to turn problems into puzzles. Try this puzzle, for instance: all you need to do is count how many squares there are in this picture (answer at the end if you need it, but do have a go first – no cheating!). This sort of simple puzzle is hugely popular on Social Media like Instagram and Facebook, despite being a maths workout. 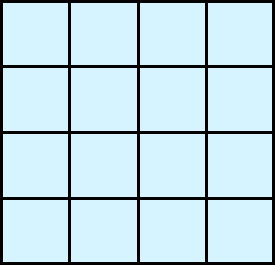 A-level students might like to find how many squares in total in a 10×10 grid? For Further Maths A-level: how about n by n? 6. BOOK A HOUSE OF MATHS VISIT FOR YOUR SCHOOL: if this all sounds like hard work, it is! – but House Of Maths is here to help! A typical School Visit will include maths shows and / or maths workshops, so why not enquire about a booking today? – I look forward to seeing you all soon! CONCLUSION: maths can seem abstract, so as teachers we must use passion, pictures, props, playful puzzles and even stories to bring it to life. I hope this article will give you some ideas of how to do that. Answer to “how many squares” puzzle: the 4×4 grid has 16 little squares, nine 2×2’s, four 3×3’s and one big 4×4 square (the whole shape), so 42 + 32 + 22 + 12 = 30 squares in total. The pattern in general for the nxn grid: the formula for the sum of the first n squares is 1/6 n(n+1)(2n+1) squares in total.